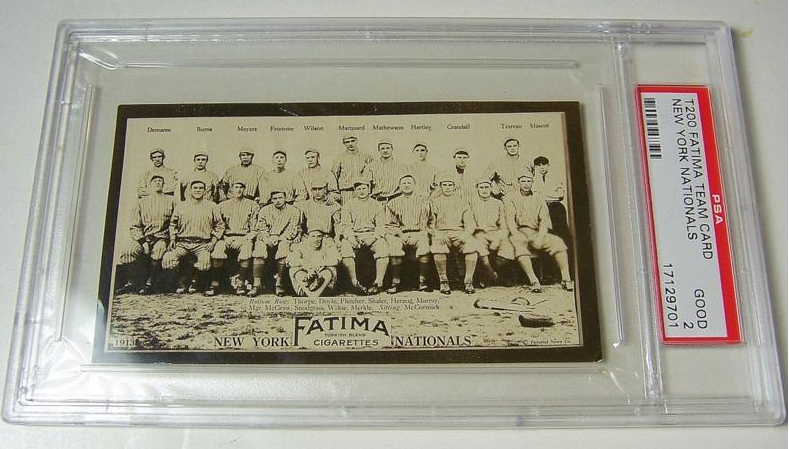 The 1913 Fatima Cigarettes Team Cards (also known as T200’s) are some of the most interesting pre-war cards someone could add to their collection. At this point in The Hobby, there were very few cards containing multiple players pictured on the front. Thats what makes them so unique. There are only 16 cards in the set, and they measure a little bit bigger than your standard card of today. Just like a lot of vintage cards, condition is everything. All of the T200’s have black borders which makes it extremely difficult to find them without chips or nicks. What surprises me the most about this set are the prices. 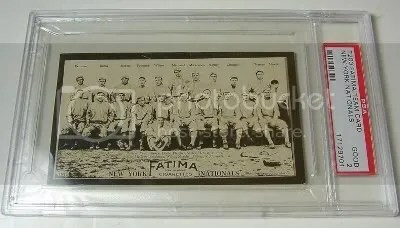 I was shocked when I saw a New York Nationals Team Card sell for under $150.00. Sure its in good condition, but you can still clearly see each player and read their names. I think its a great price considering Christy Mathewson, Buck Herzog, and Jim Thorpe are in the picture. Its not too often you can add an original Thorpe, Mathewson, or Herzog to your personal collection for under that price. 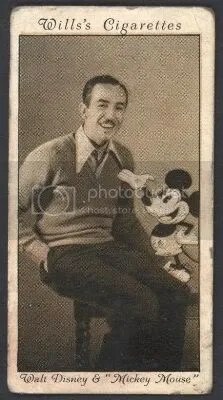 If your a true vintage collector and on a budget, I’d suggest checking out this set. Its very possible to find one at a decent price. Someday I hope I can pickup the Philadelphia Athletics card.